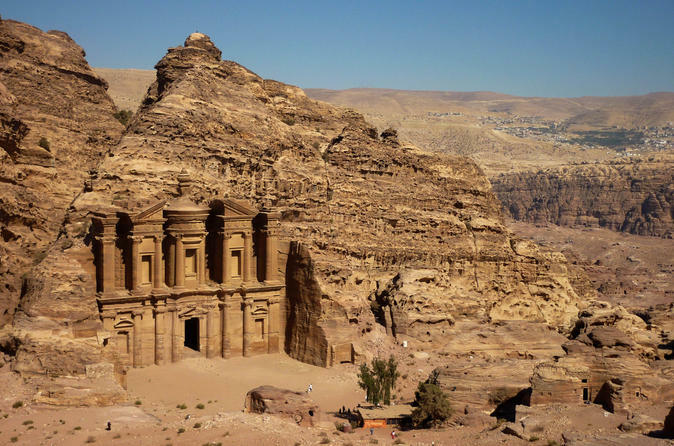 See the best of Petra in 4 hours tour with a private, professional guide . See the famous attractions that Petra is known for, such as the siq ( narrow gorge ), the treasury (Al kazneh; where Indiana Jones was filmed ), the street of façades , the early necropolis , the royal tombs, the Cardo (Roman street ). Afterwards climb to the Monastery (the second best façade in Petra; after the treasury ). Stop at a Bedouin cafe for a cup of mint tea or Turkish coffee! A romantic way to see Petra. 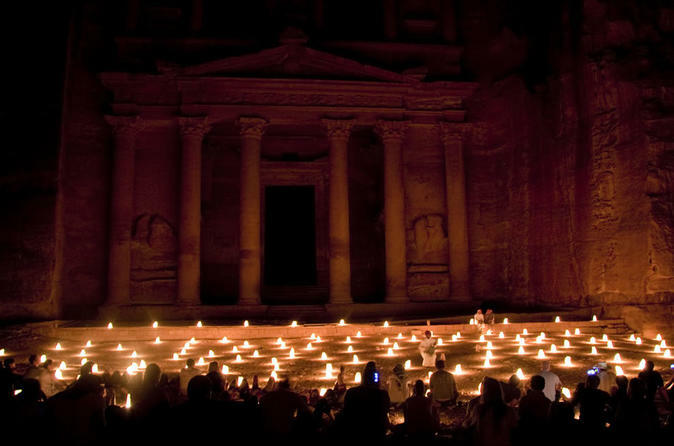 The Petra by Night tour is not your typical sound-and-light show. There are no colored laser beams, no booming amplified music or recorded actor narratives, just a remarkable chance to experience Petra as the ancient spice caravan travelers must have seen it. 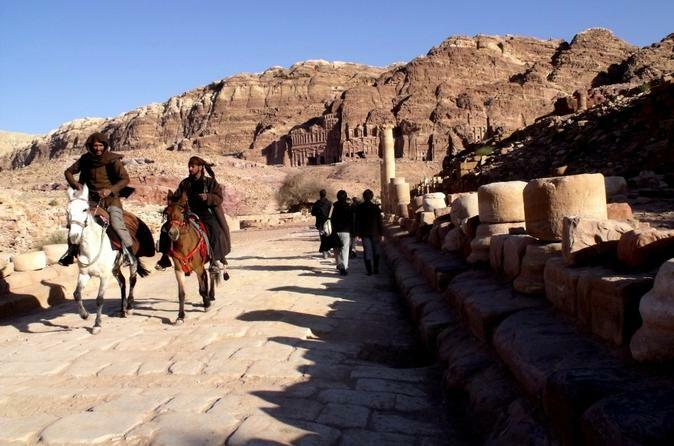 Go off the beaten track on a horseback-riding tour through Petra. With an expert guide, explore deep into Petra, perfect trip if you have previously seen Petra but want to explore further. 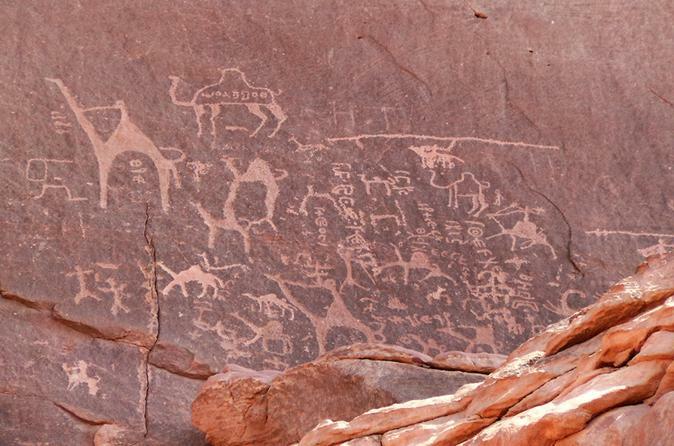 Explore the magnificent Wadi Rum in a 4x4 on this private tour from Petra. Travel to this protected wilderness in a 4x4 with a Bedouin driver around its valleys, canyons and deserts. Discover rock inscriptions, craggy mountains and narrow gorges; and see sites associated with TE Lawrence, the famous ‘Lawrence of Arabia.’ On this private tour, you travel in a comfortable private minivan with a driver, and enjoy personalized attention from your Bedouin driver-guide. 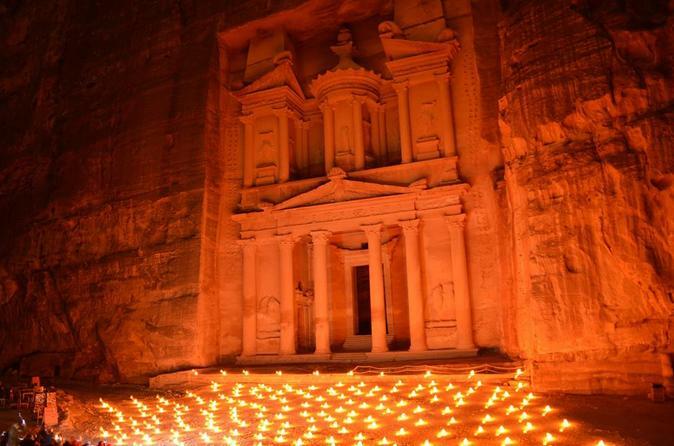 Petra has a special charm that is amplified at night. This tour starts from the entry gate to Petra passing the Siq where you will walk until you reach the treasury. The whole way will be lite by candles and accompanied with a Rababa that carries you away to the old time. In the morning depart from your Dead Sea hotel lobby then ride on the Desert Highway for 2.5-hours to the astonishing rock city Petra. This fascinating ancient Nabatean capital once dominated the Arabian trade routes. At the Visitor's Center buy the tickets to Petra, and explore the mystic site. Pass the Siq, a narrow gorge where you get the first close views of the colorful sandstone, ending at the beautiful treasury. Walk along the Street of Facades to the Royal Tombs, the theater and Qasr Al Bint. Then, enjoy time on your own, before returning to meet you driver and return to your hotel. 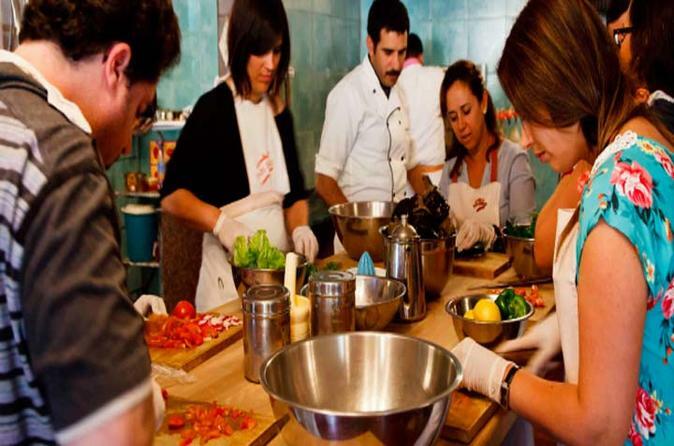 Join for an unforgettable experience, and help to prepare your own dish and not any dish, an original Jordanian dish. There is no better place for doing that than in an authentic Petra kitchen. Here visitors will enrich their experiences on a nightly cooking class. See small Petra in a 1 - 1 hour 30 minutes. Little Petra is the business quarter for Petra itself and is good to visit before the real Petra. 4x4 safari in Little Petra exploring the unique scenery. 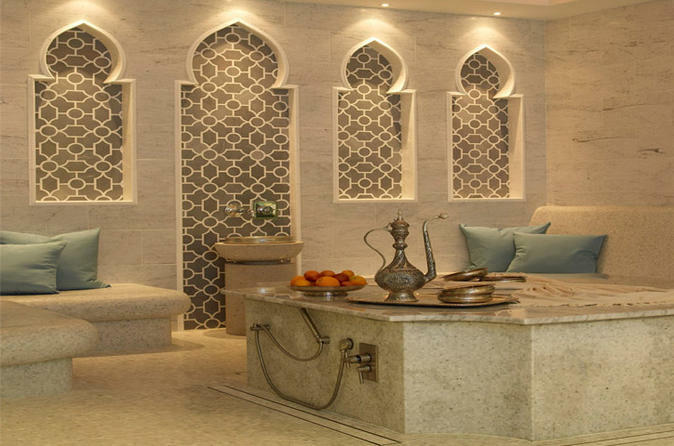 The Turkish hamam, otherwise known as a Turkish bath, is the Middle Eastern variant of a steam bath. During the Ottoman Empire the bath played an important part in Middle Eastern culture. 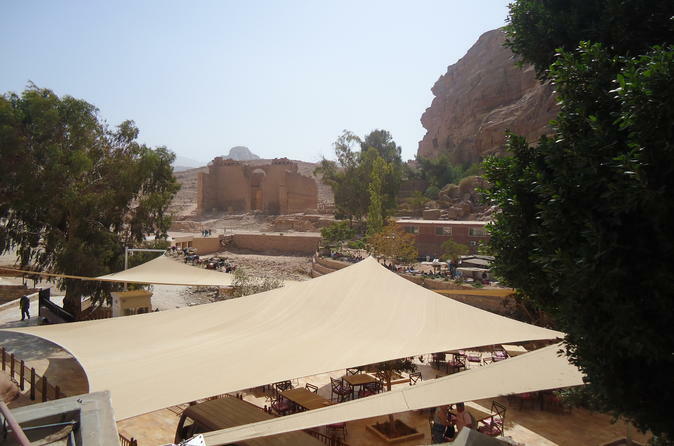 Have lunch inside Petra at the famous basin restaurant located at the heart of the ancient Rose City surrounded by the magnificent ruins of Petra. 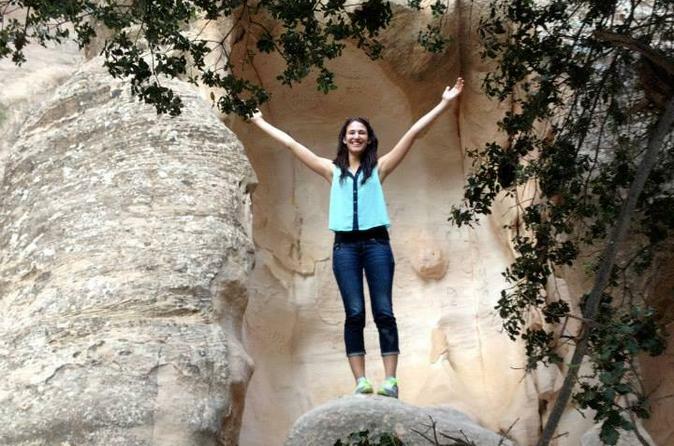 This five day tour gives you a great opportunity to see the highlights of Jordan. Start with a panoramic tour of Amman center, downtown with its Roman Theater, traditional markets, churches, mosques, and the new modern city. 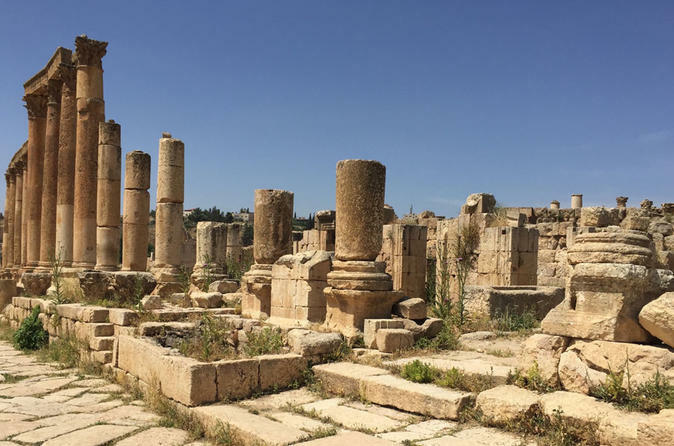 Proceed to Jerash one of the most complete and best preserved cities of the Roman Empire. Then roll down to the lowest point on earth the Dead Sea, its calm shining water glowing from its scorching sun known for the concentration of salt and minerals, which makes it a therapeutic as well as a unique swimming experience not to be missed. Carry through for a classic 2 hours visit of Wadi Rum in a 4x4 local Jeeps. The desert of Wadi Rum where Matt Damon movie the Martian was filmed. It is full of mountains and a reddish hue. 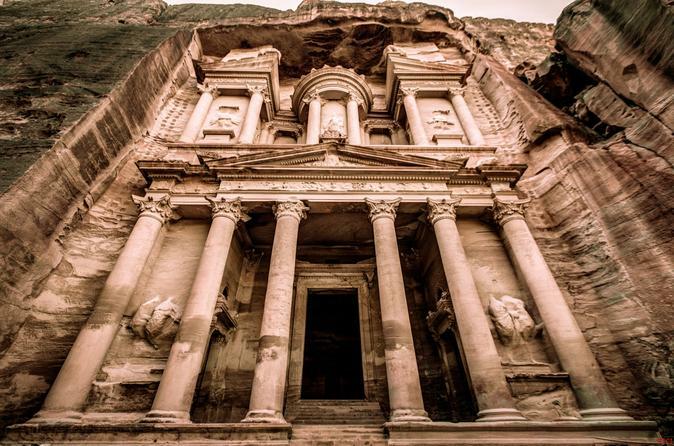 Then head to visit Petra one of the Seven Wonders of the World, and one of Jordan’s most enchanting Archaeological sites. 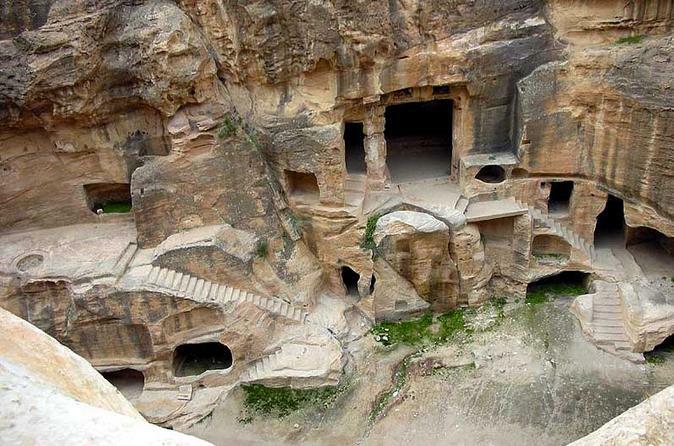 A city carved in stone more than 2000 years ago to dominate the trade routes of ancient Arabia.